Besides sand, all locomotives need water, and plenty of it! The SCLCo motive power gets it's water from the Pescadero Creek near Mick-elangelo Falls. 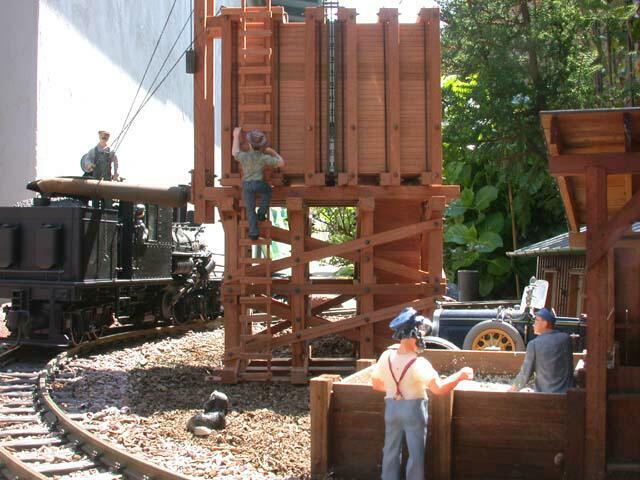 The water is pumped into a Rectangular Water Tank for delivery to the thirty iron beasts that haul the logs. Like the Sanding Facility, the Water Tank was built by the logging crews during the off season. 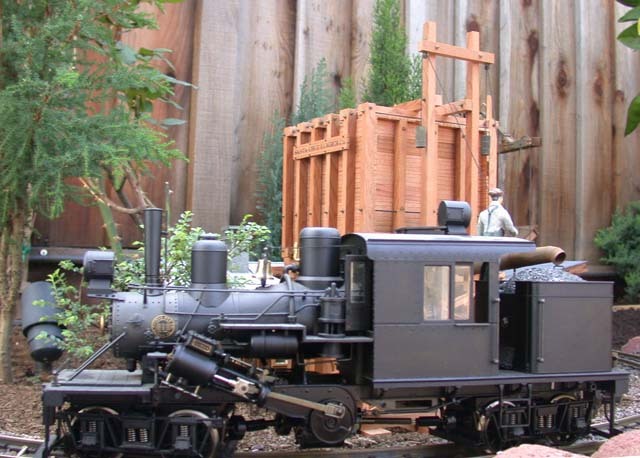 Also like the Sanding Facility, the design of the tank is purely functional, and was built from redwood lumber sawn in the company's own mill, with such metal fittings as were required being made by the company blacksmith. 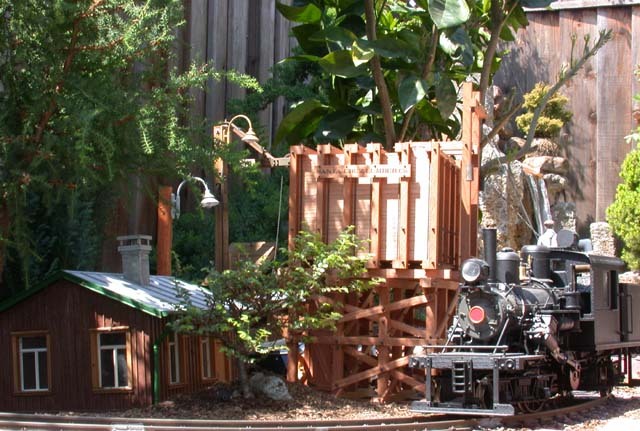 A water spout was salvaged from one of the previous logging railroad operations, long since gone, that preceded the SCLCo in the same area of the Santa Cruz Mountains. An area that had rusted through was patched and the spout was pressed into service. In the tank's design and construction we see again the rather miserly attitudes of the company's Owner & CEO that is elsewhere mentioned. However, as the saying goes, one cannot argue with success, and the SCLCo is a very successful logging and lumber operation during an era when economic success is the rarity rather than the norm. For that, we must give credit where credit is due. If anything can be said about the CEO, it's that he knows the value of a dollar, and how to squeeze one for all its worth! The idea for a railroad was his to begin with, and if not for him, logs would still be moving by ox team, and the company would probably have failed like so many others during the Depression. SCLCo No. 1 takes on water before her next trip hauling empties back to the woods. Steam locomotives are thirsty beasts to be sure!!! As can be seen here, Mick-elangelo Falls are nearby (visible just above No. 1), providing a good source of water to pump into the tank. Located adjecent to the Sanding Facility, all servicing operations can be handled relatively quickly (the Old Man absolutely insists upon efficiency)!! The newly constructed Water Tank will weather pretty rapidly. The Sanding Facility was constructed less than one year ago, and already shows signs of being out in the rain. It doesn't take long! 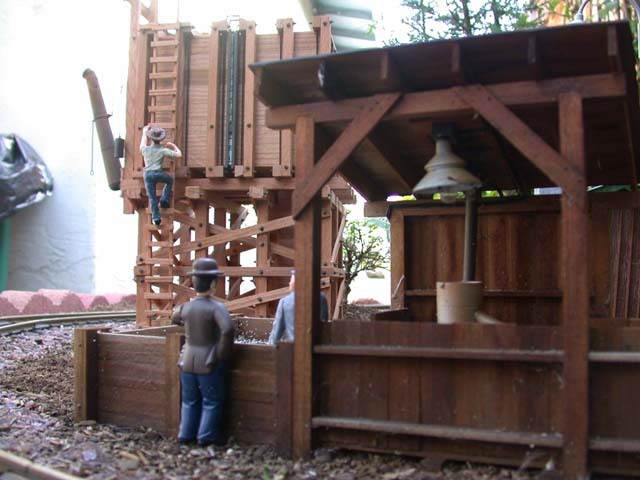 The model was scratchbuilt of scale lumber sawn at home from a redwood 2x6. The entire assembly is made of individual boards glued with Titebond II. Nut-Bolt-Washer castings are from Ozark Miniatures, and the spout and counterweights are a Grey Wolf product available through Hartford. Simulated nail heads were embossed where appropriate. 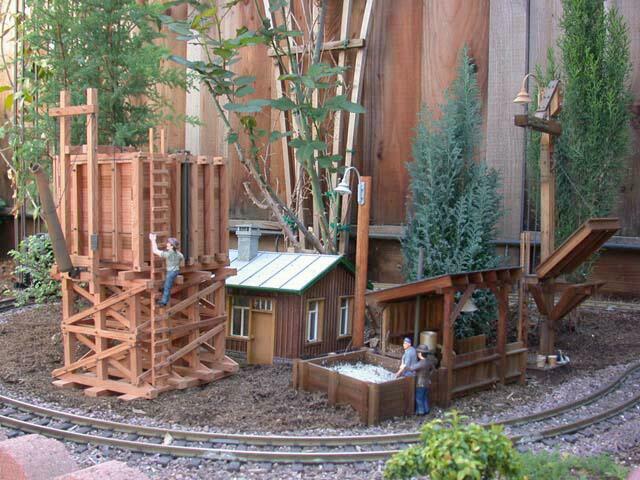 The inspiration for this structures came from an O-Scale kit by Evergreen Hill Design. I bought the kit and essentially scaled up the dimensions, changing a few things here and there. I build to the scale of 1:20 where 0.05" = 1" and 0.6" = 1' - close enough to 1:20.3, where 0.591 = 1' and a lot simpler to work with. I've written an article with complete instructions on how to build this tank as part of a scratchbuilding tutorial. Those interest will find this article on myLargescale.com in the Resources section. Pre-installation detail photos are available here.